House School for 12 years. She loved photography, hiking and camping, and was extensively involved in the Girl Guides which led to her attending an International Guide Camp in Switzerland in 1957. Later as a Guide Captain she met (Sr.) Doreen who told her about SSJD. Although planning a secretarial career, she spent a year at Neuchatel Junior College in Switzerland where she took up skiing and fencing along with developing her love of travelling which would later include much of Europe, Australia and the Far East. Back in Vancouver, she worked in the tourist and travel industry. While working with a new employee, Elizabeth was told, “You should become a teacher!” A B.Ed. at UBC followed where she was “urged to go into Honours English.” Travel and church interests increased culminating in two years teaching in Japan as part of the Anglican Church’s Volunteers in Mission. On her return she joined the staff at Crofton House “teaching English and religious studies and stayed for 26 ½ years.” Having learned earlier from Sr. Doreen about SSJD, Elizabeth had become an Associate and “in 1969 felt called to the Community but my parents were unsupportive, so I gave up the idea.” In 1984, Sr. Elizabeth was married “gaining not only a husband but two sons.” In late 1992 a brain tumour ended Ben’s life. 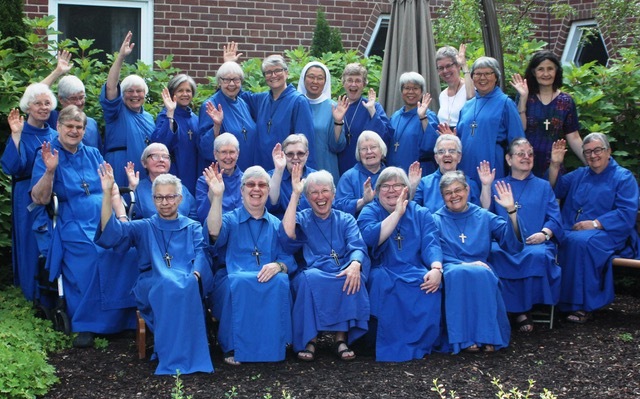 In her Associate annual report in 1995 Sr. Elizabeth noted that she “was part of a small group of women searching for something more, perhaps Oblates.” She attended the Women at a Crossroads in 1996 without any thought of joining the Convent. After four days of the programme she felt a call to the religious life, and entered SSJD in 1997 at age 55. Highlights have included her time in the Montreal branch house, being Director of Associates, Novitiate Director (“It’s a great privilege to nurture new members”), leading retreats and quiet days, assisting Sr. Elizabeth Ann (while Elizabeth Ann was Reverend Mother), and editing the Eagle. Sr. Elizabeth was elected the Reverend Mother and installed in May 2015.